Makarios Condos are located in Saint Augustine Beach, Florida, about five miles south of historic downtown Saint Augustine. 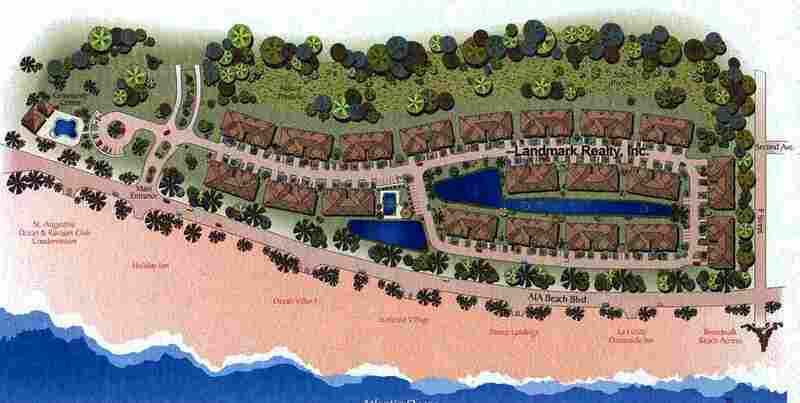 There are a total of 160 individual condominium units at Makarios. Two and three bedroom units are available, all with two baths. Built in 2003, with four spacious floor plans ranging in size from 1544 – 2089 square feet, Makarios offers some of the newest and largest condos in Saint Augustine Beach. Each of the buildings in Makarios has eight units. Each unit includes a single car garage with a private entrance. Makarios condos are essentially attached single family homes, situated across the street from the white, sandy Saint Augustine beaches. The condominiums are concrete block construction on both levels. The laundry is located inside each unit. The Saint Augustine beach condo community features underground utilities and is gated for your privacy and security. At this time, there is no on-site rental management. Makarios condos are ideal as long term rentals (6 months – 1 year) and primary residences. We do not handle rentals. Amenities offered at Makarios Condos include: two swimming pools, outdoor family areas, and nature preserves.